Our goal in the long term Kongossa Technology has always been to share knowledge within a North America-Africa framework where we continuously forge ahead while promoting the African environment. For instance, back in Montreal our team coordinated a roundtable discussion on technology and social good on the occasion of Global Social Economy Forum (GSEF) which resulted in us meeting, for example, this social and technology entrepreneur from Ivory Coast who started the baby lab, and whose skills and projects could but catch our attention. Just like his presentation on Technology At The Service Of Communities the importance of common good; a clear evidence in favor of the eco-system as a sine qua non for development. Back to Silicon Mountain. Unarguably it is the breeding ground par excellence for start-ups in Cameroon. This video only confirms that fact. Buea is located in the Anglophone part of Cameroon, the South-West Region. This region is extremely famed for not only hosting one of Cameroon’s political capitals in the past, but also the highest summit in the country; Mount-Cameroon. The town of Buea enjoys a unique geographical position with its close proximity to Nigeria – African’s economic and demographic giant -, and to Douala, the economic capital of Cameroon. Its working population is quite young. Unarguably, the Buea University plays a greater part in this phenomenon by attracting Cameroonian youths from the other remaining nine regions. Our goal was to assess the level of Cameroon startups in general and those based in Buea in particular. To set things in motion, we received special support from the Local Community Head Otto Akama, who showed us around and escorted us as we visited entrepreneurs in their offices. Our team was a small group visiting from Montréal. Our team’s first call ActivSpaces happened in a collaboration space where entrepreneurs meet daily to work, share ideas, talk with visitors and potential investors etc. On a personal level, it was an environment I was familiar with and I had a work history with some of the entrepreneurs I was meeting yet again. Our team had a talk with Ahmed, the entrepreneur Ahmed Felata of a startup VIVA working on a music/video application ,a little similar to Netflix, to provide public transport passengers with the best traveling experience. For a startup of this magnitude, Ahmed had made quite a progress and, was already looking for investors last June. 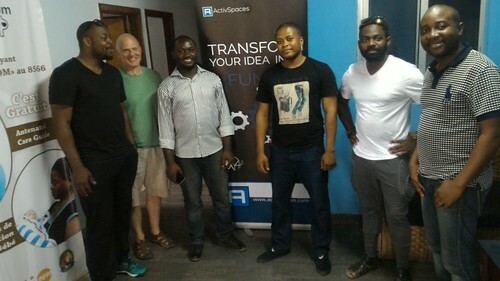 During this visit, our team also had an encounter with the very renowned Fritz Ekwoge, one of the pioneers and pacesetters of the startup movement in Buea. 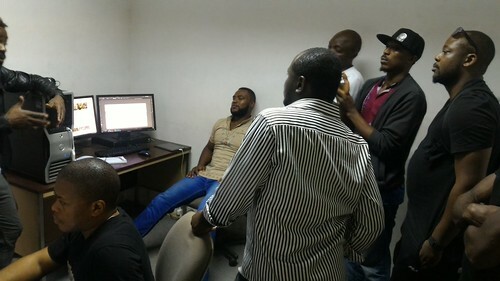 He was working on the second version of his application Feem Perfect which is specialized in the fast transfer of files. Our team kept meeting Buea-based entrepreneurs as the clock ticked by. The majority of entrepreneurs we talked to back in 2015-2016 were currently in another phase of their project. NDjorku, Feem Perfect for example now benefit from foreign funding and expertise to enable them hold unto a clear blue-print, which is great. But the highlight of our trip was when we met some entrepreneurs behind the Colorfluid studio. I was personally very impressed by the expertise and vision of these two entrepreneurs. We took the commitment to collaborate with them in the near future on an upcoming animation project in Montréal. In my opinion, this studio should work with all those entrepreneurs we saw, to give them support as far as showcasing their project is concerned, but also to provide them with the necessary online platform which is currently unavailable. The growth of startups is plagued by common problems: Although platforms like ActivSpaces do exist, it is still difficult for these young minds to work in an appealing environment. Nonetheless, our team still met some high-spirited entrepreneurs who are braving heat, noise, power cuts etc. Startups lack support or endorsement from local companies: It has been mentioned earlier on that Buea is close in proximity to Douala, Cameroon’s “economic nerve center”. However, very few entrepreneurs mentioned collaborating or partnering with local companies during our study trip. Though change is still pending, there is no doubt that this situation will be different tomorrow looking at the pace at which these youths create innovative platforms while increasing their skills. Providing entrepreneurial expertise and knowledge in project management: In our opinion, these young entrepreneurs should benefit from elementary courses in project design and management in a bid to create platforms meeting the needs of their immediate environment. The need for a Mobile Lab in Buea: One out of two Africans has a mobile phone and 725 million subscribers could be trending for individual contact numbers by 2020. Startups based in Buea and across Africa stand to gain a lot, if they focus on creating contents and applications for this device. However, it does not end at creating applications. They also need marketing skills to propose user-friendly, useful and fun-filled experience to clients.